Kalamazoo, MI February 4, 2016 – For their fourth concert of the 2015-2016 Symphonic Series, The Kalamazoo Symphony Orchestra presents Beethoven and Nielsen. Yukie Ota, our very own principal flute and YouTube sensation, will perform Nielsen’s Flute Concerto and Yaegy Park, 2015 Stulberg International String Competition Gold Medalist, will perform Prokofiev’s Violin Concerto No. 1. Maestro Raymond Harvey will close the program with Beethoven’s beloved Symphony No. 6. Written in 1926 for Holger Gilbert-Jespersen, Carl Nielsen’s Flute Concerto remains one of the most popular flute concertos. Inspired by the Copenhagen Wind Quintet’s performance of Mozart, Nielsen set out to write a concerto for each member of the quintet. Unfortunately, due to his poor health, he only completed a flute and an oboe concerto. Prokofiev composed his first violin concerto during 1917—a productive year in which he also completed the Classical Symphony, third and fourth piano sonatas, and Visions Fugitives for piano. His Violin Concerto No. 1 incorporates two previously composed sections. Prokofiev composed the opening melody in 1915 during his love affair with Nina Mescherskaya and the remaining movements were inspired by a 1916 Saint Petersburg performance of Karol Szymanowski’s Myths by the violinist Paul Kochanski. Nathan Milstein championed the concerto and it has subsequently become one of the best recognized violin concertos. To close the program, the Kalamazoo Symphony Orchestra will perform Ludwig van Beethoven’s Pastoral Symphony (Symphony No. 6). Beethoven spent a great deal of time walking in nature. In order to achieve greater mental clarity, he often left Vienna to compose in rural locations. Completed in 1808, Beethoven’s sixth symphony contains the sounds of nature. Though the music contains specific programmatic elements, Beethoven regarded his sixth as “more the expression of feeling than painting.” Containing some of his most tuneful and relaxing music, Beethoven’s Symphony No. 6 has earned a special spot in the hearts of music lovers. This season Maestro Harvey celebrates 17 years as Music Director of the Kalamazoo Symphony Orchestra. He previously held the top post at the Fresno Philharmonic (California), Springfield Symphony (Massachusetts), and El Paso Opera (Texas). In 2014, Yukie Ota won 2nd prize in the Carl Nielsen International Flute Competition. She became famous when a butterfly landed on her forehead during the competition and she continued to play without letting the butterfly impact her performance. Known as “Madame Butterfly,” her video was viewed over two million times on YouTube. Yukie also received the Orchestra Prize, Audience Prize, and the Children’s Jury Prize from the competition. Earlier in 2014, she won the “Newly Commissioned Work” Prize at the 36th annual Young Artist Competition during the National Flute Association Convention. In 2011, she won first prize in the Chicago Flute Club Solo Artist Competition. As a young artist Yukie was invited to participate in music academies and had the opportunity to perform at well-known festivals around the world such as the Musica Riva Festival in Italy, the Music Festival in Oviedo Spain, and the Kyoto Music Academy in Japan. Additionally, she was invited to participate in the Verbier Festival Orchestra in Switzerland conducted by Valery Gergiev, The Pacific Musical Festival in Japan conducted by Riccardo Muti and Fabio Luisi, and the Incheon & Arts Festival in Korea conducted by Chung Myung-Whun. In 2011 Yukie Ota was appointed principal flute of the Kalamazoo Symphony Orchestra. As an orchestral player, she occasionally performs as a substitute flutist at the Chicago Symphony Orchestra, Ravinia Festival and the Osaka Philharmonic Orchestra. 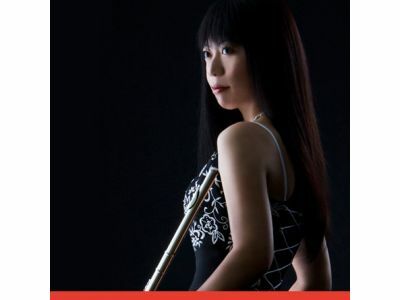 Yukie received her Master’s Degree from DePaul University School of Music in Chicago, where she studied under Mathieu Dufour, principal flutist of the Chicago Symphony Orchestra. Violinist Yaegy Park was born in 1997 in Houston, Texas. She began violin studies at age three, and had her first concert at age four as a Houston Young Artist. In 2008, Yaegy was named a Jack Kent Cooke Artist and performed on the NPR show From the Top. Over the next few years, she won top prizes in competitions such as the American Protégé International Competition, the International Russian Rotary Children’s Music Competition, the International Virtuoso Competition, the YWCA New York Music Competition, LISMA International Competition, the NY Chamber Players Competition, and the Blount-Slawson Young Artist Competition. Yaegy is also an avid chamber musician, having won competitions in the chamber division at the KRB NY International Music Competition and the Crescendo International Music Competition. She was recently named a Young Arts Winner of 2015. Currently, Yaegy attends Juilliard Precollege studying with Catherine Cho. She is a member of the Foundation for the Revival of Classical Culture. For their fourth concert of the 2015-2016 Symphonic Series, The Kalamazoo Symphony Orchestra presents Beethoven and Nielsen. Yukie Ota, our very own principal flute and YouTube sensation, will perform Nielsen’s Flute Concerto and Yaegy Park, 2015 Stulberg International String Competition Gold Medalist, will perform Prokofiev’s Violin Concerto No. 1. Maestro Raymond Harvey will close the program with Beethoven’s beloved Symphony No. 6.